Plantation Bay Golf & Country Club is a luxurious active lifestyle community in Ormond Beach, Florida. This gated community offers memberships at three different levels to provide the perfect lifestyle for anyone. There is no age-restriction at Plantation Bay, and the well-crafted homes and country club amenities appeal to homebuyers with an active social lifestyle. Plantation Bay Golf & Country Club offers world-class amenities to those who choose to become a member at any level. While a membership in not required to live within the community, it is required to use any of the amenities inside Plantation Bay. The Clubhouse Membership allows residents to enjoy any of the amenities and dining options within Club de Bonmont and the Prestwick Clubhouse. The Fitness Membership allows members unlimited use of the fitness center and pool along with full social and dining options at both clubhouses. The Sports Membership allows members to have unlimited access to the spa and fitness center, tennis facility, both clubhouses with limited golf play. Sports members also enjoy a list of social clubs and scheduled tennis clinics and tournaments. The Full Membership provides members with access to all of the amenities within the community. Along with full use of the fitness center, both clubhouses, and unlimited golf, members also enjoy discounted rates at other local courses, as well as on-site accommodations for guests of members at Plantation Bay. Started in 1988, Plantation Bay Golf & Country Club will be comprised of nearly 5,000 homes upon its completion. Homebuyers can choose from resale inventory in the community or build a new home designed by one of the preferred builders. Homebuyers can find condo units on a resale-only basis that offer approximately 1,600 square feet. They have two or three bedrooms, two bathrooms, and a carport for parking. ICI Homes offers both attached homes and single-family residences. These models offer low-maintenance exteriors and open floor plans. Ranging between 1,529 and 4,350 square feet these models have two to five bedrooms, two to four bathrooms, and two to four-car garages. All homes offer easy living with first-floor master suites and laundry rooms. Some models offer second floors with extra bedrooms and loft spaces. Kargar Construction also offers custom single-family homes within the community. These luxurious homes are located specifically in the Woodbridge Estates neighborhood of Plantation Bay. These estate homes range in size between 3,619 and 5,888 square feet. All models have at least three bedrooms, two bathrooms and a two-car garage. These models offer convenient first-floor living with classic finishes and beautiful exteriors. Plantation Bay provides its residents with lifestyle choices to be as relaxed or busy as they want. Residents who join any one of the memberships are encouraged to partake in a number of clubs and activities in the community. Some of those activities include water aerobics classes, cardio tennis, bocce ball, yoga, or Pilates. Both the Prestwick Clubhouse and Club de Bonmont provide great settings to enjoy the company of neighbors. Plantation Bay is a golfers paradise with 45-holes of golf for any level of play. Residents who do not choose to utilize any of the memberships will enjoy all the surrounding area has to offer in Ormond Beach. 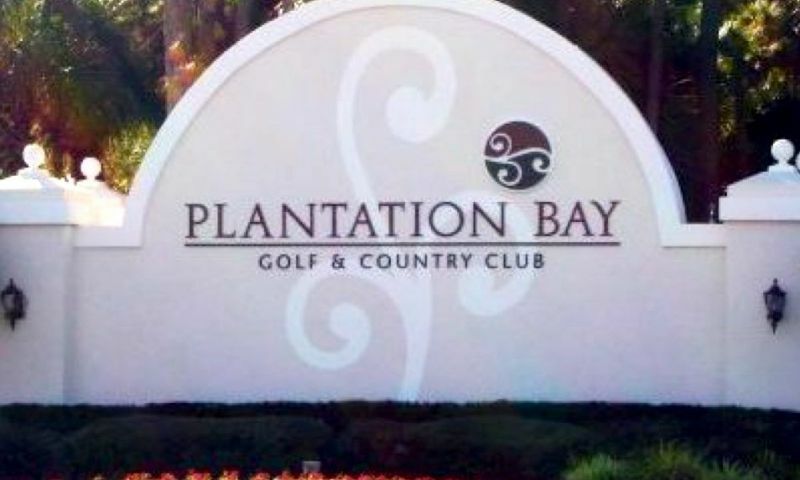 Plantation Bay Golf & Country Club is conveniently located just off Highway 95 in Ormond Beach. This allows quick access to nearby cities like Jacksonville, Daytona Beach, and Orlando. The surrounding area offers endless opportunities for shopping, dining, and entertainment. Nature lovers will enjoy the close proximity to both the North Peninsula State Park as well as the Tomoka State Park. Quick day trips to the beach or one of the several other nearby golf courses make this area a favorite among those leading an active lifestyle. Plantation Bay Golf & Country Club has a great resort-style amenities for buyers seeking a social lifestyle in Ormond Beach, Florida. The Club de Bonmont is a members-only club. The Prestwick Clubhouse is a members-only club. The Spa & Fitness Center is a members-only club. State of the Art Fitness Center - 7,000 Sq. Ft.
Plantation Bay Golf Club is a members-only golf club. There are plenty of activities available in Plantation Bay Golf & Country Club. Here is a sample of some of the clubs, activities and classes offered here. Plantation Bay Golf & Country Club offers homebuyers condo units on a resale-only basis. Condos offer approximately 1,600 square feet of living space with two or three bedrooms and two bathrooms. Condo units also have a carport for parking space. Please Note: Floor plans are not available at this time. ICI Homes offers three attached models. These homes provide between 1,529 and 1,741 square feet of living space. They have two to three bedrooms, two or three bathrooms, and an attached two-car garage. ICI Homes offers a variety of unique single-family homes. These homes have open floor plans and first-floor master suites. They range from 1,716 to 4,350 square feet of living space with three to five bedrooms, two to four bathrooms, and two to four-car garages. These custom homes are built by Kargar Construction and are located specifically in the Woodbridge Estates neighborhood. These luxurious estate homes range in size between 3,619 and 5,888 square feet. All models have at least three bedrooms, two bathrooms and a den. These models offer convenient first-floor living with classic finishes and beautiful exteriors. Snowbirds from Pittsburgh Pennsylvania, we love it here at Plantation Bay! A beautiful community that offers every amenity you'd expect and only minutes from the beach! Plantation Bay is an amazing community. The clubhouse and golf facilities are top notch. We opted for the full membership and although yes, it is a little expensive, it's been worth every penny. We golf a lot and use the range weekly plus we are on leagues too. The tennis courts are very nice as are the pools and fitness facilities. Dining here is also superb. There are thousands of homes here in every price range so it's nice to be able to live here on nearly any budget plus you can pick your membership level for the clubhouse so you just pay for what you will actually use. Everything is perfectly maintained and done very well here. We highly recommend this neighborhood to anyone. 55places.com is not affiliated with the developer(s) or homeowners association of Plantation Bay Golf & Country Club. The information you submit is distributed to a 55places.com Partner Agent, who is a licensed real estate agent. The information regarding Plantation Bay Golf & Country Club has not been verified or approved by the developer or homeowners association. Please verify all information prior to purchasing. 55places.com is not responsible for any errors regarding the information displayed on this website.